Instagram images used with permission. All rights reserved. Image courtesy of VerdiFarms. All rights reserved. In giving consideration to these factors, you'll be better prepared to match your system to the best varieties for your desired outcome. Here is some guidance to help you get your container/hydroponic basil production off to a successful start. Sleeved and ready for market, these 'Genovese' basil plants were grown using an ebb-and-flow table by Johnny's Territory Sales Representative Paul Gallione. Live plant with growing medium still attached. Live plant in a nursery container/pot. Individual leaves or bunches packaged in a bag or plastic clamshell container. Baby-leaf crop grown in a hydroponic raft system, harvested at 4–6" tall, and packaged in a bag or plastic clamshell container (this is a less common end product). 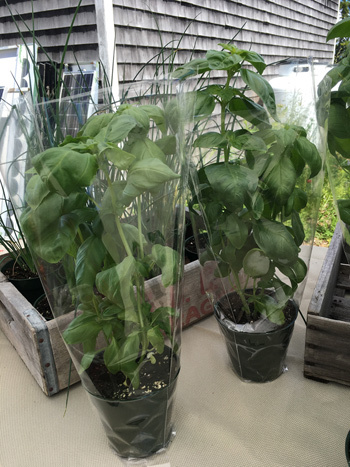 Adding a plastic sleeve to protect live product can help prevent plant damage at market and extend shelf life. Note: Johnny's medium-size Cut Flower Sleeves fit 4–4½"-diameter, round nursery containers. For live plant sales, varieties that produce compact, attractive, full, and uniform plants are ideal. On the other hand, if the primary end product is individual leaves or bunches, then plant habit is of less concern, and variety selection may be driven more by yield, flavor, and leaf type. Regardless of the end product, slow-to-bolt varieties extend the harvest window and fast-growing varieties speed crop time for a faster turnover. Side-by-side-comparison of the two primary types of green basil: Genovese (left) and Italian Large Leaf (right). There are two primary types of green basil, each with distinguishing flavor, yield, and leaf type features. Genovese basil is prized for its classic pesto flavor and characteristic, heavily cupped, spoon-shaped leaves. Genovese is largely the preferred type for culinary use. Italian Large Leaf basil is known for being highly productive. Plants are dense and produce large, pointed, rugose (wrinkled) leaves that are typically thicker and more durable than the leaves of Genovese types. Growers like Italian Large Leaf type varieties because of their strong yields and durable leaves, although its sweeter flavor is not appreciated by all eaters. Discerning basil eaters will pick up on the stronger notes of anise or cinnamon commonly present in this type of basil. In addition to the green basil types, specialty types include Red/Purple, Citrus, Greek, Asian/Thai, and Lettuce Leaf basils. Each offers variety in color, flavor, and culinary use. For more information, see our tech sheets on Basil Downy Mildew Awareness & Prevention and Basil Pests & Diseases. The two most common diseases of basil are Fusarium wilt and downy mildew, both of which are fungal pathogens. Selecting disease-resistant varieties can be helpful when disease pressure is high. 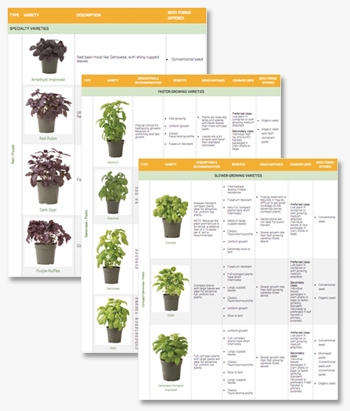 Our Hydroponic & Container Basil Varieties Comparison Chart outlines key attributes of each recommended variety in Johnny's basil line, to help you select the best varieties for your priorities and desired end-product. To compile the chart, we reviewed data from trials by independent hydroponic growers in combination with our own variety knowledge and the information we receive from our suppliers. The chart included images, descriptions, key benefits, drawbacks, common uses, and seed forms of Faster-Growing, Slower-Growing, and Specialty varieties. Most commercial growers use 3–6"-diameter pots for retail herb production. We recommend a 4"-diameter pot to provide a balance between efficient use of growing space and producing plants of a size optimal for market appearance and value. Seeds can either be sown directly into the retail container or into a plug tray and after 2–3 weeks of growth, transplanted into the retail container to finish. The seeding rates recommended below represent a wide range. Using fewer seeds will produce an attractive container provided the plants are grown under optimal conditions, with plenty of light, space, and time for plants to fill out. Using more seeds per container will produce a fuller appearance for finishing at an earlier stage of production. For additional cultural recommendations, refer to the information in our Herb Grower's Library and on our seed package backs. Image courtesy of Dallas Grown. All rights reserved. pH: 5.8–6.2 (slightly higher in aquaponic and organic systems). Light: Minimum 14 hours per day. 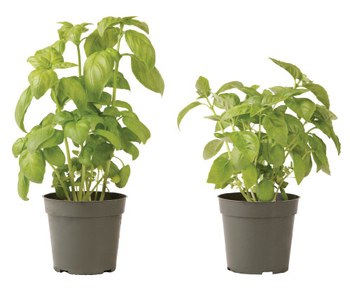 DLI (Daily Light Integral): Minimum 12 mol per m2 per day or higher; basil performs well with high light levels. EC (electroconductivity): 1.0–1.4mS, depending on the season; during winter, crops need a higher EC than during summer. Nutrient Solution: Choose a solution specific to herbs and leafy greens and appropriate for your water type. 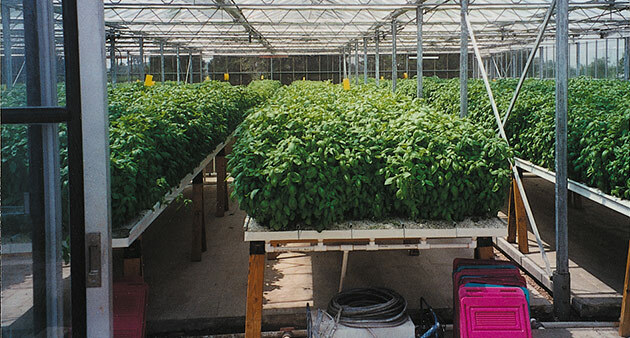 It is advisable to grow basil in isolation from other crops so that you can adjust the nutrient solution and other environmental variables as needed; basil grown under conditions optimized for another crop may not perform well. We encourage you to conduct your own on-site trials to determine the input levels and environmental conditions that work best in your growing system.